How perfect are these 10 Pomeranian dog names? The hardest part is deciding which to go with! Guess you’ll just have to get 10 dogs! Just kidding…sort of! 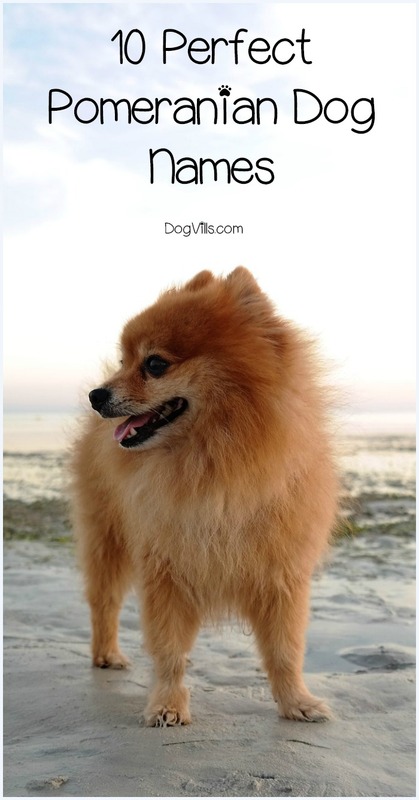 Pomeranians may be small dogs in size, but they are definitely ginormous in personality! They’re darling full of swagger and sass. They don’t walk, they strut, like they know they don’t need to be big to command a presence in a room. When it comes to finding perfect Pomeranian dog names, look to other small but mighty characters throughout history, film and literature for inspiration! Here are a few of our favorites! Alfie- Alfie is a name from English origin and means- sage, wise. Alfie is the name of 2 popular movies: Alfie was a 1996 romantic, comedy, drama that starred Michael Caine and a 2004 remake that starred Jude Law. Bugsy- Bugsy is a name from English origin and means- crazy. Like Alfie, Bugsy is also the name of 2 popular movies. Bugsy Malone was a 1976 musical, gangster, comedy movie starring Scott Baio and Bugsy was a 1991 crime drama movie starring Warren Beatty. Charlie- Charlie is a name from English origin and means- man. Charlie was the name of the white Pomeranian that belonged to Harry Houdini, the famous illusionist, most known for his death-defying escape acts. There have been several actors named Charlie, including Charlie Sheen and Charlie McDermott. Romeo- Romeo is a name from Spanish origin and means- from Rome. Romeo is the main character in the play, Romeo and Juliet, by William Shakespeare. There are several states that have areas with the name Romeo, including Romeo, Colorado, a small town in the San Luis Valley region; Romeo, Florida, a community in Marion County and Romeo, Michigan, a village in Macomb County. Tango- Tango is a name from Latin origin and means- touch. Tango is a partner dance that originated in Buenos Aires, Argentina during the 1880’s. In Cook Islands mythology, Tango was the son of a primordial mother goddess and an ancestor of a skilled fishing family. Chelsea- Chelsea is a name from English origin and means- seaport. Throughout history, there have been several notable females with Chelsea Clinton is the daughter of former President Bill Clinton and former First Lady Hillary Clinton. Chelsea Cooley was the 2005 Miss USA. And then there are the actresses Chelsea Kane, Chelsea Noble and Chelsea Handler. Diamond- Diamond is a name from English origin and means- jewel. Diamond is a gemstone that is made from the hardest natural material. Diamond was also the name of the Pomeranian dog that belonged to Sir Isaac Newton, the famed mathematician and physicist. Ivana- Ivana is a name from Hebrew origin and means- gift from God. Ivana, voiced by Emma Stone, was the Pomeranian pet of the character, Lipton Tipton, played by Brenda Song from the television series- The Suite Life of Zack and Cody. Phoebe- Phoebe is a name from Greek origin and means- bright, shining. Phoebe was the name of the white Pomeranian dog that belonged to Queen Charlotte, the wife of King George III. In Ancient Greek mythology, Phoebe was the Titaness of bright intellect and prophecy. Tulip- Tulip is a name from Turkish origin and means- turban. The tulip is bulbous, perennial flower that comes in an array of colors, including cream, pale yellow, maroon and purple. For a boy, you can’t get much “bigger” than Bugsy! If naming your dog after a famous gangster doesn’t really appeal to you, though, I really do love Tango. For a girl, I’m partial to Phoebe, mostly because I was a big fan of the Charmed show! What are some of your favorite Pomeranian dog names that really show off their big personalities? Share below! Sign Up For Our Newsletter & Download it.